Just a reminder that the House Mouse and Friends Monday Challenge is at the Mid-way point for Challenge # 144 - Feeling Blue. Interpret as the color blue or Not well/sad. Closeup of these adorable little Gruffie faces. Hope you can make time to join us. Please remember, you must use a House Mouse, Gruffie or Happy Hopper on your card and follow the current theme. You have until Saturday, May 18th at 12 midnight EST to enter to win. 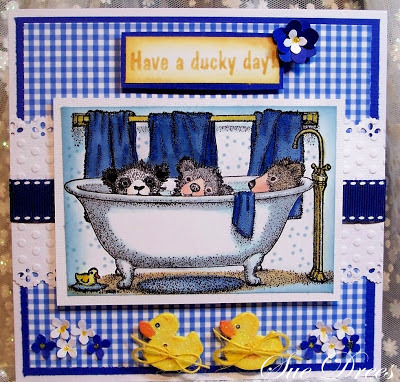 Cute: that sentiment and the little ducks! Who could go wrong with Rubber Duckies? LOL. This is just precious, Sue. I love the coloring job on your towels. The deep blue is just stunning and you've put it all together nicely. Enjoy your week. Blue gingham with yellow duckies. Be still my heart..... Just as sweet as it can be. haha...what a cute and so funny image, so looking over the edge of the bath. beautiful colouring! !amazing done. super fun image and a fantastic card Sue. Ha, I love this image! The blue you used is so vibrant! 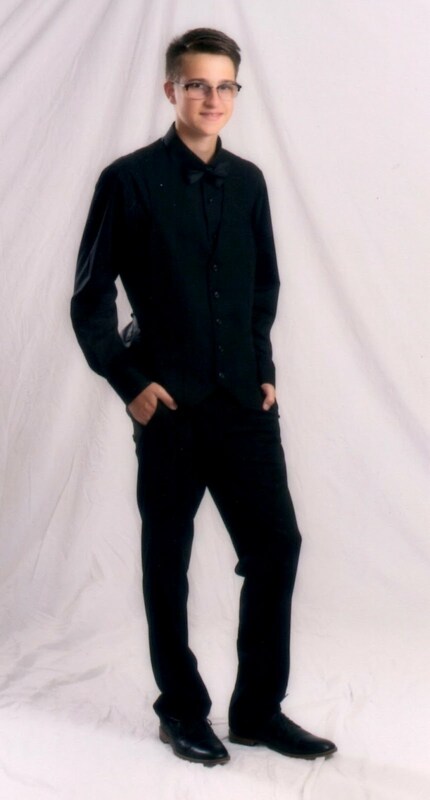 Awwww I love that image. Beautiful colours and fabulous layout. Those duck buttons are sooooo cute! That´s just AMAZING Sue.. such a cute card! 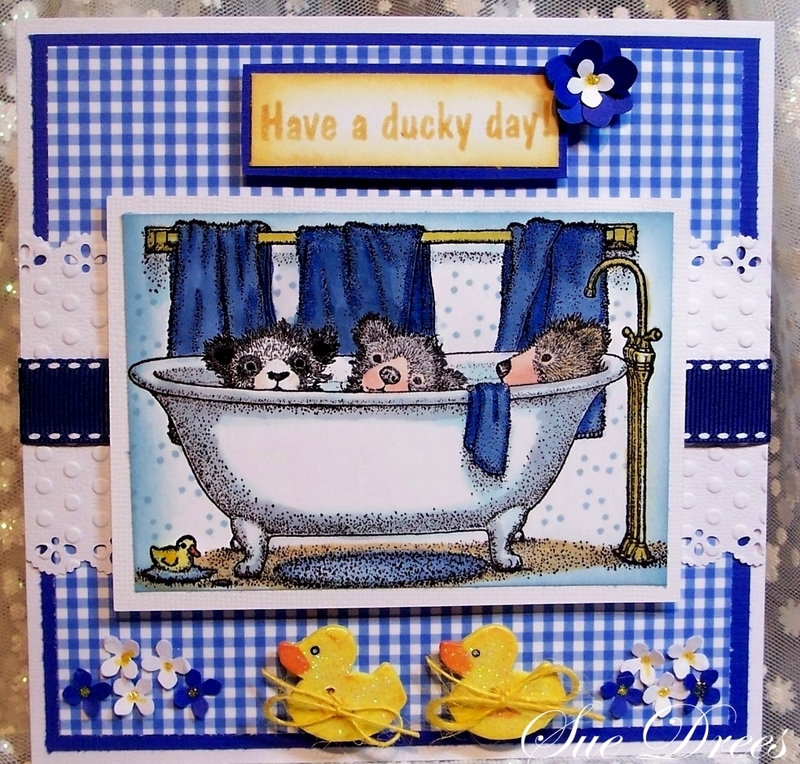 Wonderful image you have used for todays sweet card, super colours, great layout- and adorable ducks! 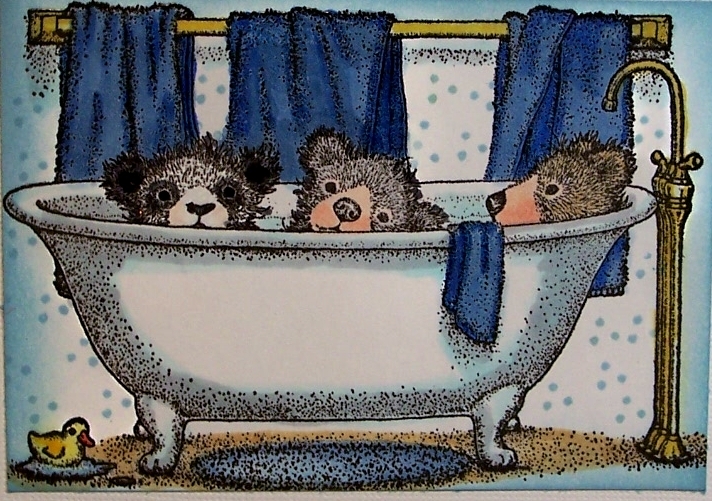 A fabulous card Sue, your colours and papers are stunning, I do love the little 'Tubby Bears' bath time - so sweet!! 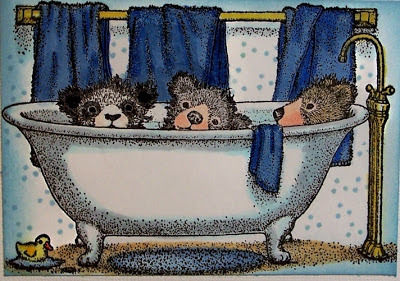 These gruffies so happy to be bathing together..lovely colouring great take on the chall theme Sue. Oh be still my heart there are bears in the tub! How fun is that. You know I love my bears. This card is super fabulous. Love it! Hi SUE! What gorgeous coloring and use of blues. LOVE THIS image.